The evil orc, Ozur, has discovered some powerful energy that will make him completely and totally unstoppable! It`s up to you to prevent Ozur from gathering this energy as you quest to the 3 Stars of Destiny! 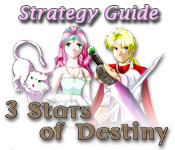 Customize your character`s abilities and skills in this exciting role-playing game. Use our helpful Strategy Guide to explore mysterious lands as you travel far away from your home and finally confront Ozur. Can you stop his evil plan? Return to "تحميل العاب - العاب فلاش"